I made a new sketchbook the other day. I buy some of my favorite paper in large rolls, then cut it to the size I want and bind by hand. Then I get the paper I want in the size I want. This new one resulted from an experiment: I wanted to see if I could bind one that would fold back on itself, and had a soft cover. 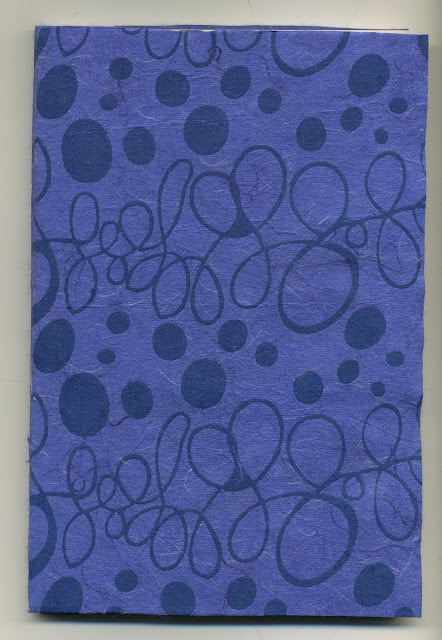 I bound the paper with coptic binding and covered it in a thick handmade paper I got at the local Fair Trade store. So far so good. 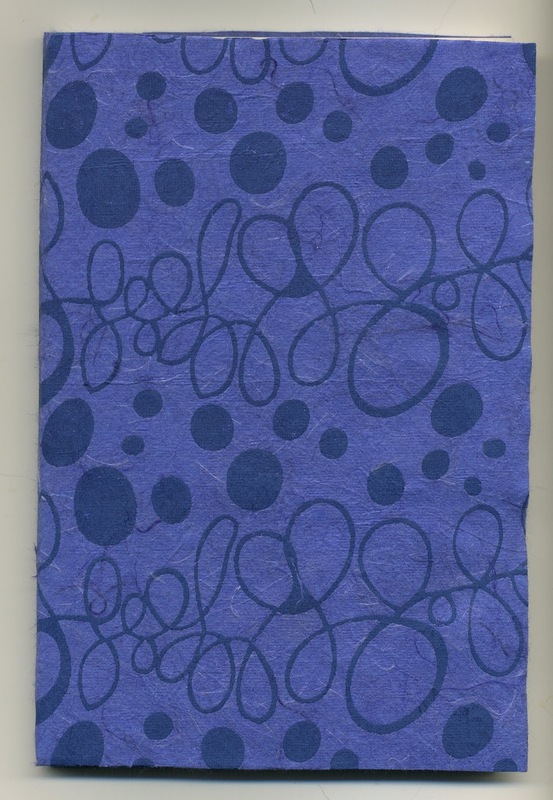 I used Bee Paper's Super Deluxe sketchpaper, because I had the end of a roll left from some time ago. I didn't worry too much about getting everything exact on this sketchbook--I plan to carry it lots of places and beat it up. So I had a good time tossing it together and now I'll enjoy it. 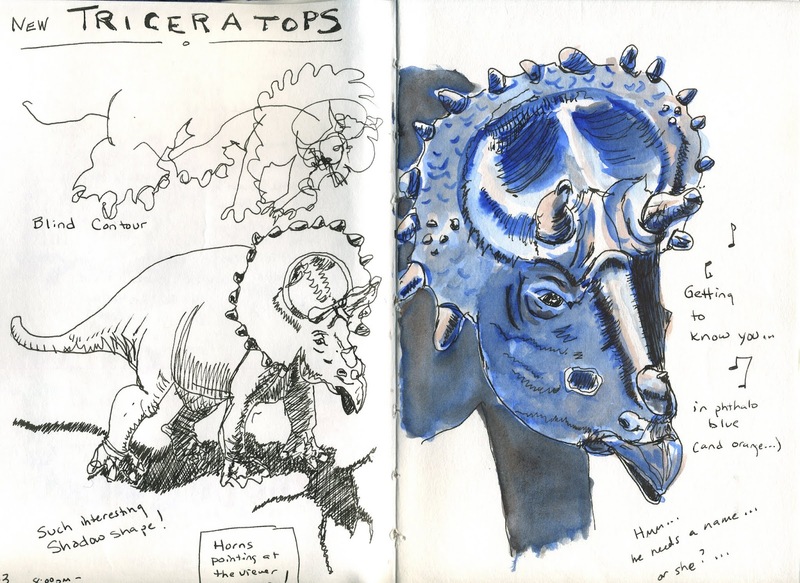 Anyhow, after scribbling in my contact and current palette information on the first page (which I do to start any new sketchbook--it gets me past the "new book" syndrome), I decided to practice my scribbling on a dinosaur! A triceratops to be exact. In phthalo blue and cadmium red orange. This is the first time I've drawn this particular toy, so I viewed this scribbling session as a "getting to know you" time. I even sang the showtune as I drew. First, a blind contour; that's the delightful mess on the upper left. Then a modified contour. Then a slower scribble of just the head, but still a scribble, not attempting to catch everything, but just exploring shapes and angles and then, some values. Let me tell you: this only sort of looks like my dinosaur! But I feel like I had a successful sketching session. I got to scribble with one of my favorite fountain pens (a Pelikan M200 fine), splash paint around, study a complex and super interesting figure (boy, I sure wish I could find a time machine and go back and see a live dinosaur), and practice my scribbling skills. What a delightful way to spend an hour! What I want to practice next time I draw this dino again is how to capture the horns when they are pointed toward the viewer. Foreshortening them is hard. They kind of disappear in my painting. So, something to work on!